This volume of newly commissioned essays provides comprehensive coverage of African philosophy, ranging across disciplines and throughout the ages. Offers a distinctive historical treatment of African philosophy. 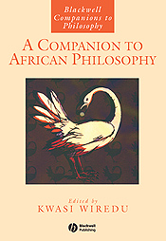 Covers all the main branches of philosophy as addressed in the African tradition. Includes accounts of pre-colonial African philosophy and contemporary political thought.